The start of a new season for Austin City Limits usually coincides with SXSW which means it’s a great opportunity to get some pretty big names into the studio. Season 42 of Austin City Limits is no different with rock icons like Iggy Pop and Robert Plant doing a taping over the next week or so. 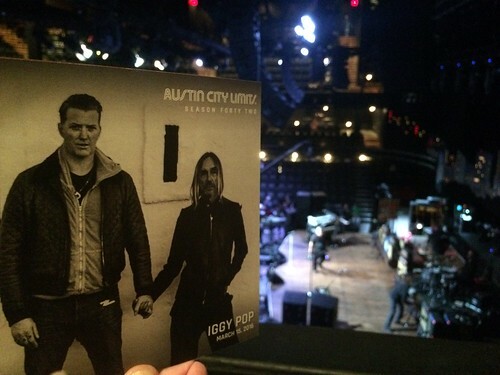 I attended Iggy Pop’s taping this past Tuesday night. It’s my third time seeing Iggy. The first time was at Texas Stadium with INXS and Guns N Roses for the Calling All Nations tour. GNR was at the pinnacle of their popularity and INXS was riding pretty high as well. Iggy was earlier in the day along with Ziggy Marley, a bit of a footnote, but I remember it being a good show. The second time was actually a free show at SXSW 1996 when the stage was at 6th and Brazos next to the Driskill. That was pretty amazing. He could still get pretty crazy twenty years ago. As you can see from the photo, the program is pretty amusing this time around. Iggy and Josh clearly have a sense of humor. It also pretty quickly highlights how huge Josh Homme is and how tiny Iggy is. This is probably my favorite ACL program since I’ve been regularly attending shows. Oddly enough, my seat for Iggy was not too far from my seat for the Queens of the Stone Age taping a couple of years ago. Pop contacted Homme a little over a year ago asking if he’d like to collaborate. They hit it off and the new album, Post Pop Depression, will be released tomorrow, March 18th. They did a showcase show encore last night at the Moody Theater. The Post Pop Depression tour appears to have limited US dates, so if you want to catch him, you might have to travel. I had already heard “Gardenia” a few times on Underground Garage and liked it. I can definitely hear Homme’s influence on the music. There are similarities to the most recent QOTSA album. The backing band for this tour is pretty much QOTSA. They’re all wearing matching red silk jackets to Iggy’s black one. I wonder how Iggy is feeling about things with the recent passing of David Bowie. The did a respectable cover of “China Girl” at the midpoint of the set. Pop probably needs to stop going bare chested at shows at this point. He abandoned his black blazer about three songs into the set. He could pull it off really well at 50, but at 68, it’s starting to be a little much. I’m guessing he doesn’t know any other way to do it though. He has a noticeable limp going. He, like my parents, probably needs hip or knee surgery. Still, his voice hasn’t gotten worse with age. I’ve noticed several singers lose their range as they got older. Iggy still has his, which admittedly isn’t super wide, but what he does have is still intact. He had no qualms about getting out into the audience during the show. My guess is that the episode will air in the fall and, of course, locally on KLRU. You can keep tabs on the schedule here. Most of my previous ACL taping reviews are here.